Each battery picked up at the Defender Warehouse Outlet Store will incur a State Mandated $5.00 core fee, at the time the battery is picked up. This fee is refundable when a used battery is turned in for recycling. 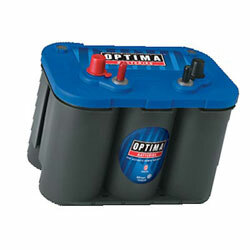 OPTIMA is the most advanced battery available. The patented SPIRALCELL technology provides many features and benefits not found in conventional batteries. Note: Specifications may be subject to change per the manufacturer.